Yucca is a root that has sticky-like property to it after it's been cooked so I decided to try this as my binding ingredient. Bottom line, this makes a nice fake burger but it is not going to hold together in a manner you are used to with beef. The use of a spatula to push all the sides together helps to keep it formed in the pan. 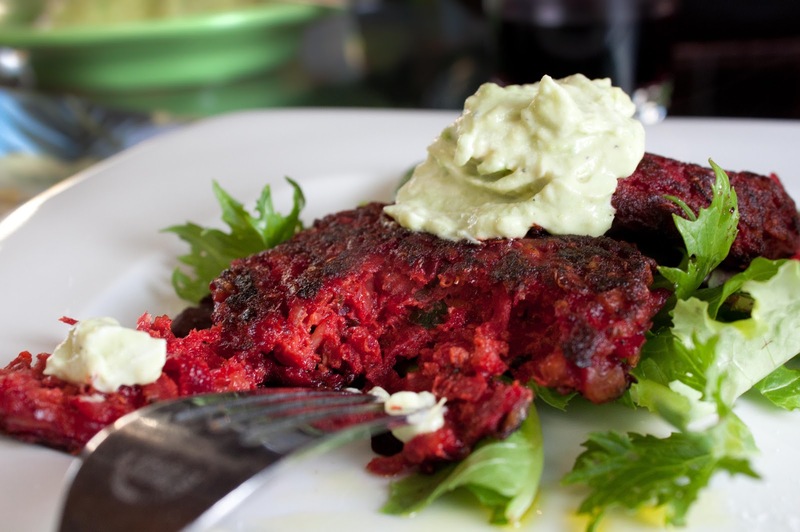 Try the beet burger over lettuce, in a tortilla or on a bun even (it definitely won't be as sloppy as a sloppy Joe. 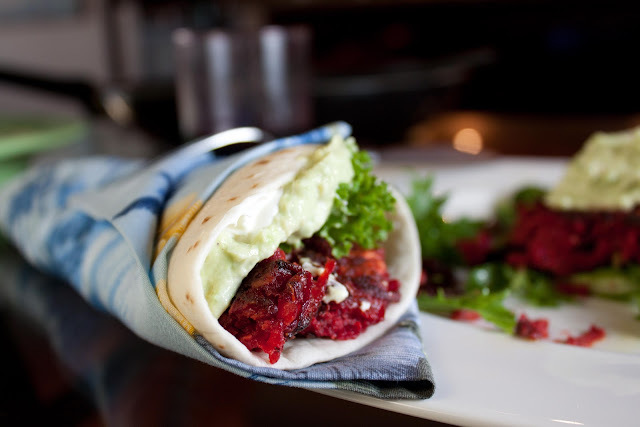 Dave wasn't so sure about this non-meat burger until he ate the beet burger tortilla wrap, at which point he proclaimed 'I could eat this!" I decided there was no point in reminding him he already did eat it. In fact he ate two. Eating vegetables isn't so bad, you might just find that it makes you fat and happy without the fat! Fat and Happy Food Blog Tips and Techniques: Veggie burgers just do not hold together well. You can add bread crumbs and an egg in place of the yucca root if so desired. But the key is to refrigerate the mixture before forming the patties. They will stay together better. These are not stiff enough to place directly on the grill (I'm still working on that piece); but you can place a pan or cast iron skillet on your gill and cook them that way. I've also noted a few ways to vary this recipe, like using quinoa instead of beans, below. If you are using the yuca root, peel and shred it. Heat a large fry pan over medium high heat with the water. Add in the shredded yuca simmer until the yuca begins to soften and the water becomes a little gelatinous. Pour into a bowl to cool. While the yuca is cooking, grate the zucchini and peel and grate the beets in a large bowl. Chop the garlic and walnuts, add to the beet bowl. Add in the beans and a good shake of the seasoning salt along with pepper, mix well. When the yuca is done cooking, place the pan back over medium heat. Add a good drizzle of olive oil then add in the beet mixture once the oil is warmed. Cook about 5 minutes until the beets become softened, toss often. Remove from heat and let cool slightly. 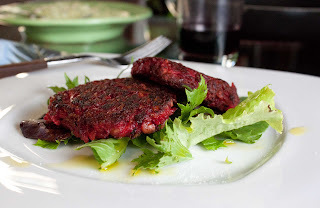 If you decide to use eggs and bread crumbs instead of the yuca, add to the beet mixture once it is cool enough to handle and continue with refrigerating as directed below. Mix together the beet mix and the yuca root mixture, place in the refrigerate to chill for at least an hour. When ready to cook, add a drizzle of olive oil in a large fry pan over medium heat. You don't want to to overhandle this mixture. take a big scoop of beet mixture and carefully drop it in the pan. Use the spatula to help form the patty. Cook until dark brown and then flip, reform as necessary and cook on the 2nd side. If you have extra mixture, form patties on a wax covered pan and freeze for later use.